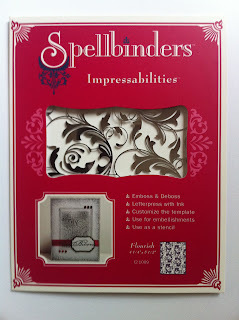 If you are as passionate about paper crafts as I am, you most certainly have heard of Stampin' Up! Recently, I received samples of their Storytime Suite for review on my alternate blog torontoteachermom.com. They have also offered up a Storytime Suite prize pack valued at $70 to give away to one of my Canadian readers. 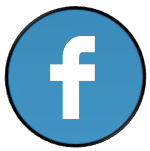 I would be happy to have you stop by and enter for a chance to win! 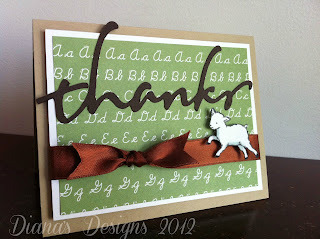 With Stampin' Up! Storytime products, teachers can easily enliven any school supplies and create do-it-yourself flash-cards or cute notebook labels. But they are also great for parents as well. The stamps and designer papers are perfect for writing thoughtful notes to teachers and classmates, and they make it super easy to add a personal touch to any project. 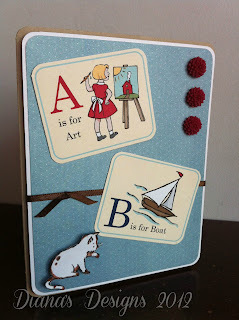 The Storytime Suite is available on stampinup.ca, along with a myriad of other fabulous craft supplies. 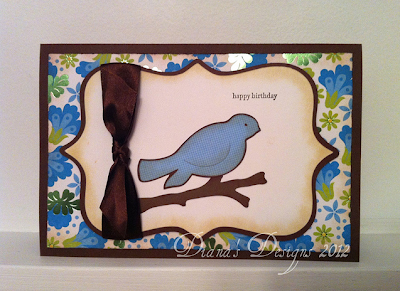 I have included a couple of photos of greeting cards I made using the Stampin' Up! Storytime Suite. 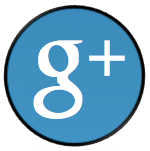 If you like what you see, I invite you to see some more examples of my work as featured on Listen to Lena. 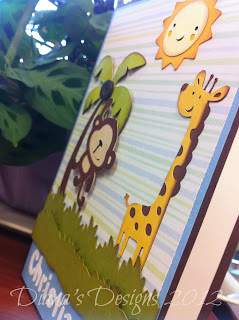 At the request of a co-worker, I created a safari-themed birthday card for a little boy who was turning one. I wasn't quite sure of the layout but I definitely knew that I wanted to use the Cricut Create-A-Critter cartridge since you really can't go wrong with any of those critters. 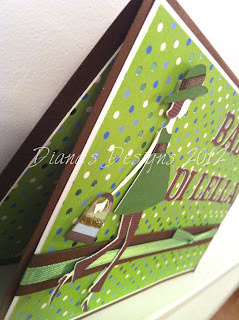 I decided to do a Google image search for inspiration and found this cute safari invitation on Handmade by Odette as well as this safari-themed card on Wickedly Wonderful. Aren't they adorable? Anywho, this is my take with a personalized twist. 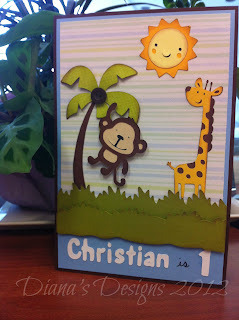 The palm tree, sun, monkey and giraffe are from the Cricut Create-a-Critter cartridge. 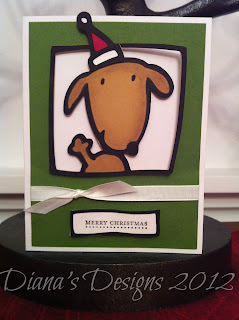 The grass cuts are both from the Cricut Paper Doll Dressup cartridge and I also used the Cricut Pooh Font Set. I inked the edges with brown ink for the animals and sun, and used both green and brown ink along the edges of the palm leaves and grass. I gently bent the palm leaves to make them pop out a little and added a random button for the coconut. I also used some pop dots to add some dimension. 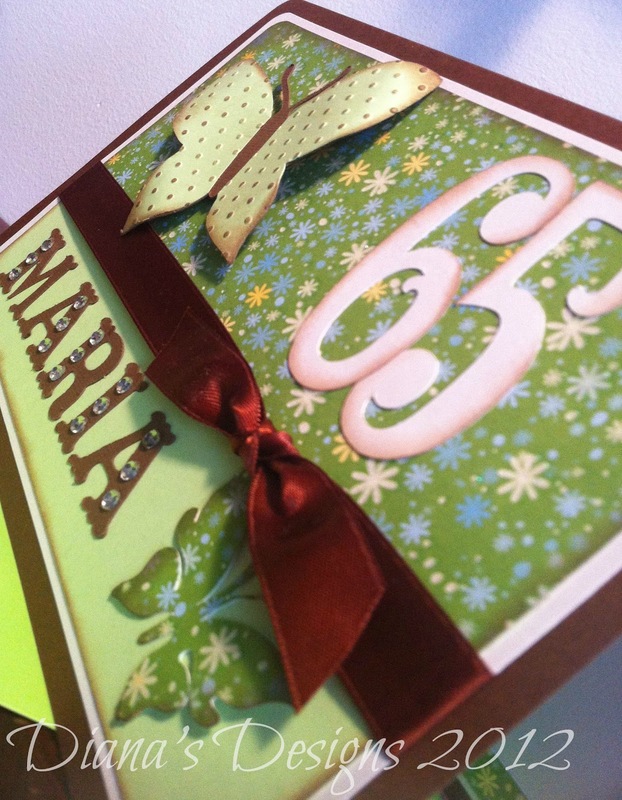 This personalized 65th birthday card is a full-size card, approximately 5.5" by 8.25". The lettering is and numbers are from the Cricut Storybook cartridge. 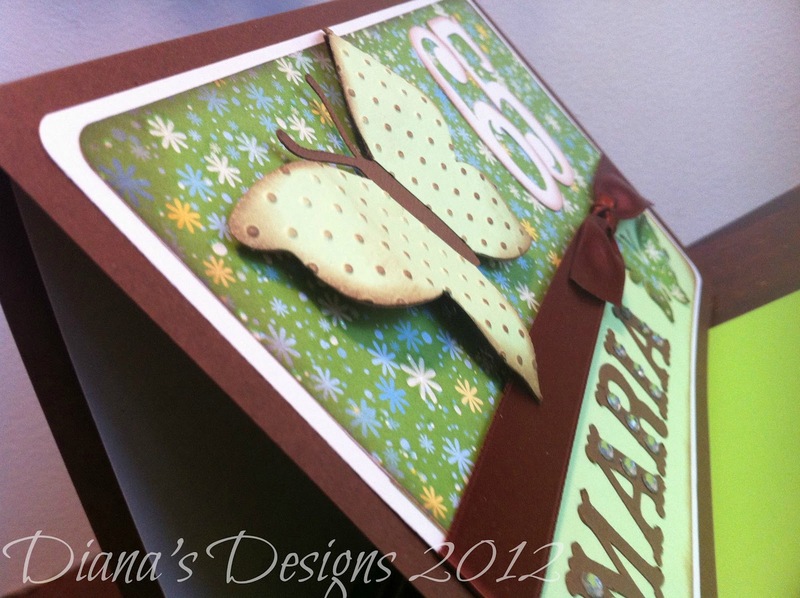 The large butterfly is from the Cricut Home Accents cartridge and embossed using the Cuttlebug Swiss Dots folder and my Big Shot. 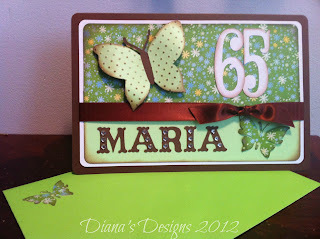 The smaller butterflies, which are my favourite, are from the Cricut Indie Art cartridge. 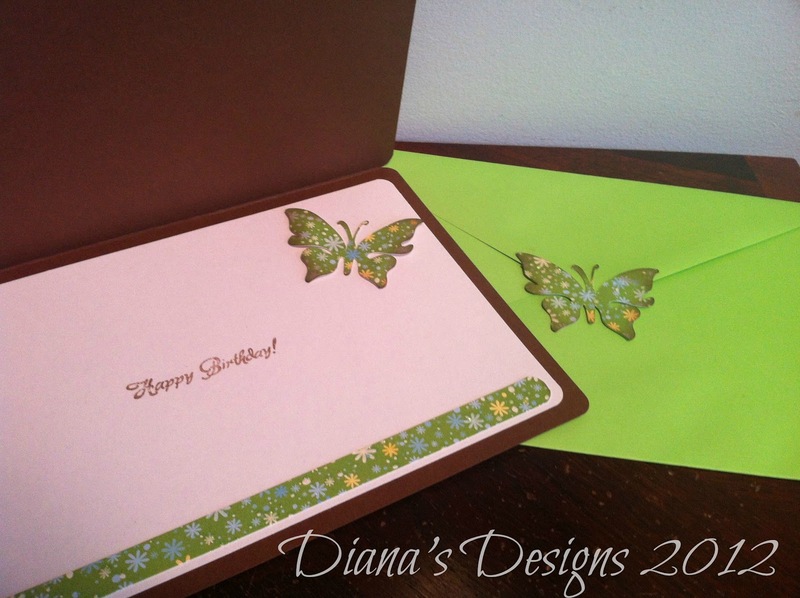 I inked many of the edges using brown ink and also inked the raised dots on the butterfly to make them pop. The ribbon is from the dollar store along with the adhesive gems. While I do like how the card turned out, I realized I'm not a big fan of the large butterfly. 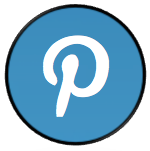 I think I would have like the one on the Cricut Stamping Solutions better. Oh, well. I made this at the request of a co-worker and she was happy with it. So that makes me happy, too! I cut out the second butterfly in different sizes to find one that fit well so I ended up with three extra butterflies. 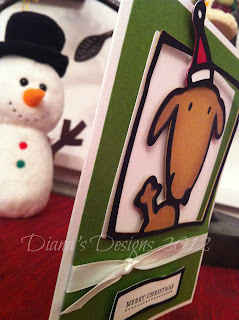 I decided to use them to embellish the inside of the card and the outside of the envelope. On the heels of the embossed bridal shower card I recently posted, I am sharing with you today another simple embossed greeting card. I made this one last spring when a colleague at work had lost a grand-parent. 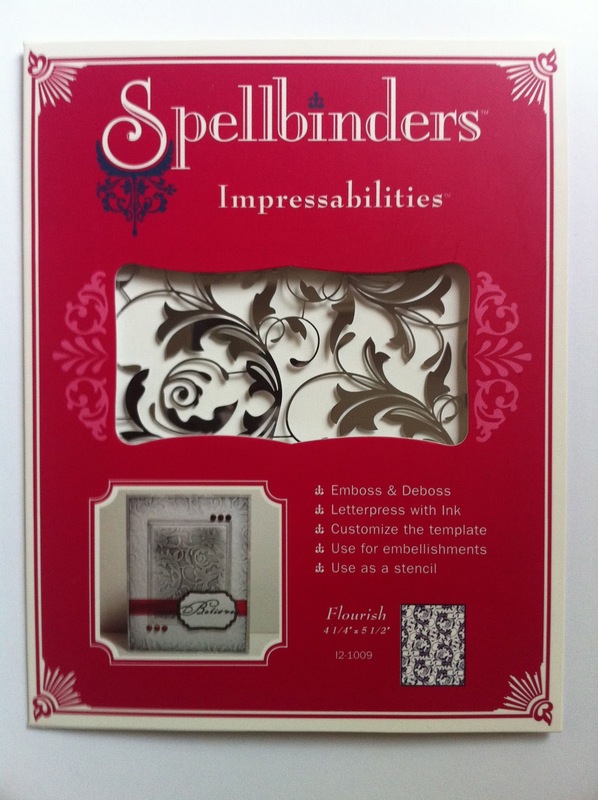 This was the first time I had used my Spellbinders Impressabilities in the Flourish design. It was actually given to me by a dear friend as a little thank-you for helping out with her handmade wedding invitations. I had never used anything from the Impressabilities line and had to play with my Sizzix Big Kick before I was happy with the outcome. 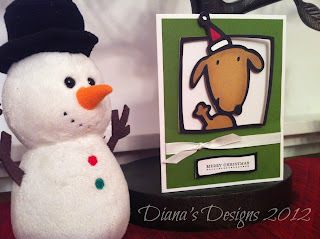 I found I had to add a couple of extra layers of card stock in between the plates in order for the embossing to stand out. 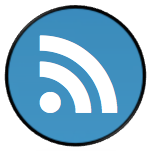 The sentiment was computer-generated. I use Microsoft Word for all of my CGS (computer-generated sentiments) and for this one, I created two text boxes using different fonts and overlapped them. 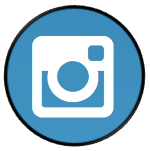 This can be done by changing the formatting of the text box layout to either Behind Text or In Front of Text and playing around with it. 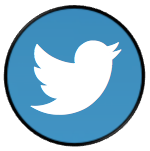 I also increased the text size of the letter S to give it more style. The grosgrain ribbon was recycled from a friend at work who always saves ribbons and other interesting items for me to use with my handmade cards. 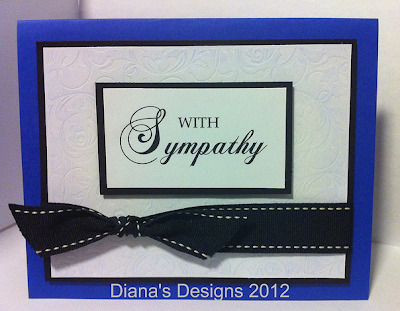 I think the solid colours is nicely off-set by the delicate embossing making this sympathy card respectfully classy and elegant. 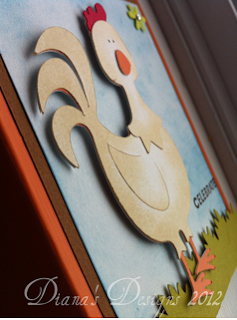 If you have a manual die-cut machine such as the Cuttlebug or the Sizzix Big Kick, you can use embossing folders to create simple but elegant cards. Here is a bridal shower card I made last month for my cousin's fiancé. The size of the card is a standard A2. I used my Sizzix Big Kick along with the multi-purpose platform set at Tab 1 as well as a pair of cutting pads. For the embossing, I chose the Cuttlebug D'Vine Swirls A2 embossing folder. All you need to do is place the paper within the folder, sandwich the folder between the two plates and place on it on the platform. Insert into the Big Kick and rotate the handle to emboss. 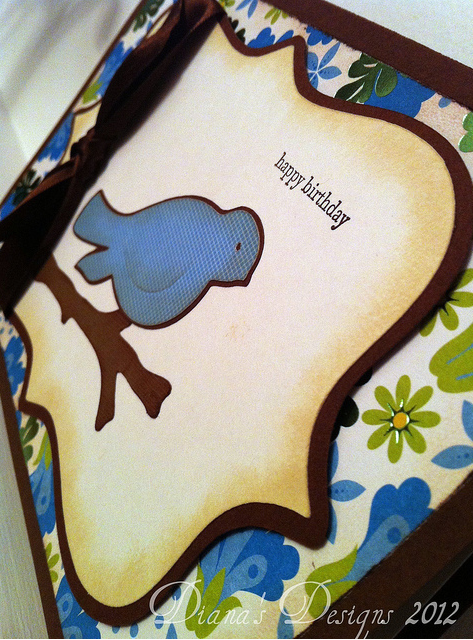 It's quite simple and I love adding texture to otherwise plain card stock. To make it pop and give it a bit of an antique feel, I took a pad of white ink and lightly rubbed it against the raised surface. Then I added a flower using a flower brad to some pink polka dot ribbon from Michael's and taped the ends of the ribbon on the back of the brown embossed card stock. 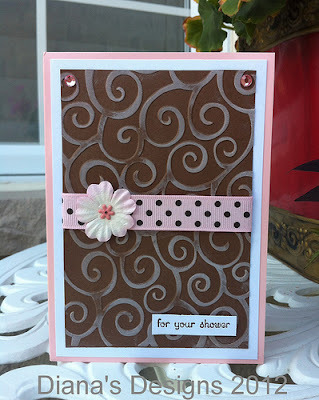 The sentiment is from Stampin' Up and the adhesive gems are from the dollar store. So there you have it. A card that is fairly simple to make yet elegant and unique! 'Tis the season to have babies, or so it seems. I don't believe I have announced it here on my craft blog but my brother is now a proud daddy of a beautiful baby girl. It brings back so many memories and I just absolutely love holding her and kissing her chubby cheeks! A co-worker is also expecting and recently attended a baby shower for a former colleague who is expecting her first. 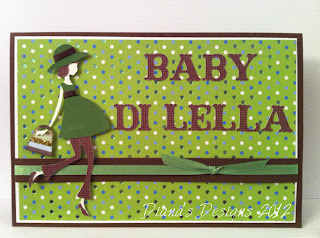 She asked if I could make a personalized baby shower card and of course, how could I refuse? I love how it turned out and think it's much better than my most recent baby shower card in brown and blue.